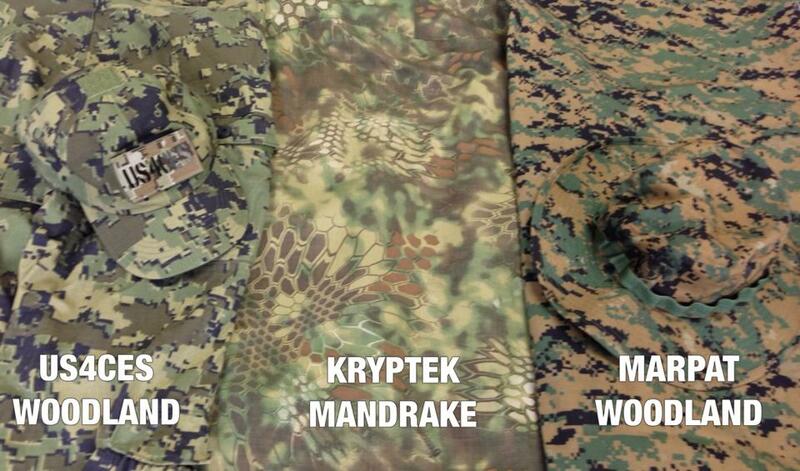 Part 3: Why Not Just Use MARPAT? (Vancouver, B.C. 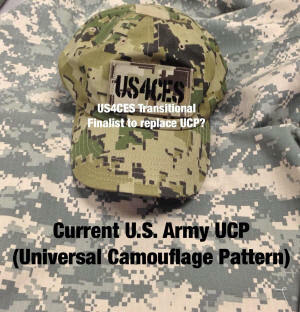 June 27, 2013) In January 2012, four companies and one U.S. Government pattern were announced for the down select in the U.S. Army’s Phase IV Camouflage Improvement Effort. 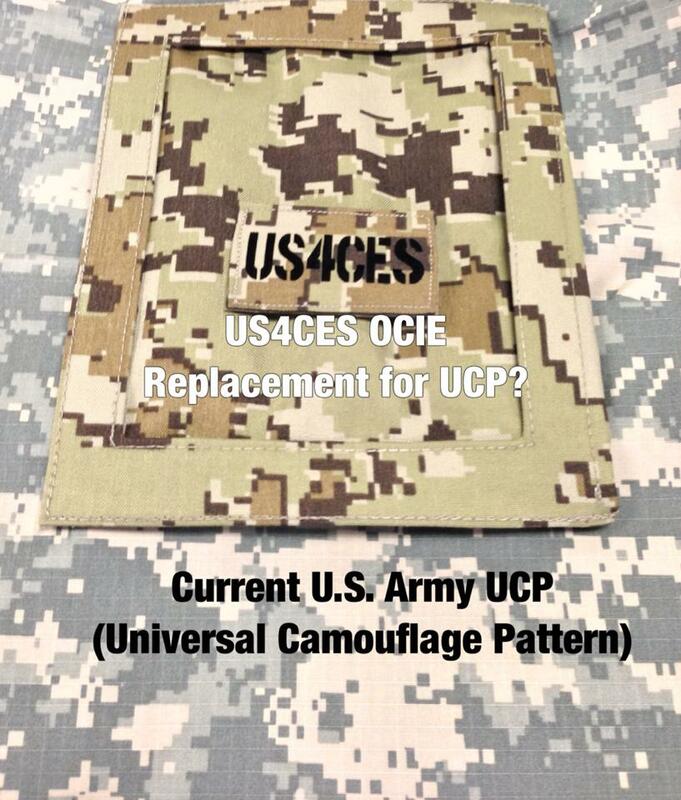 (the US4CES patterns I developed for ADS Inc. is one of the four down selected). The winner was expected to be announced on June 14th (U.S. Army's Birthday), this announcement has been postponed. 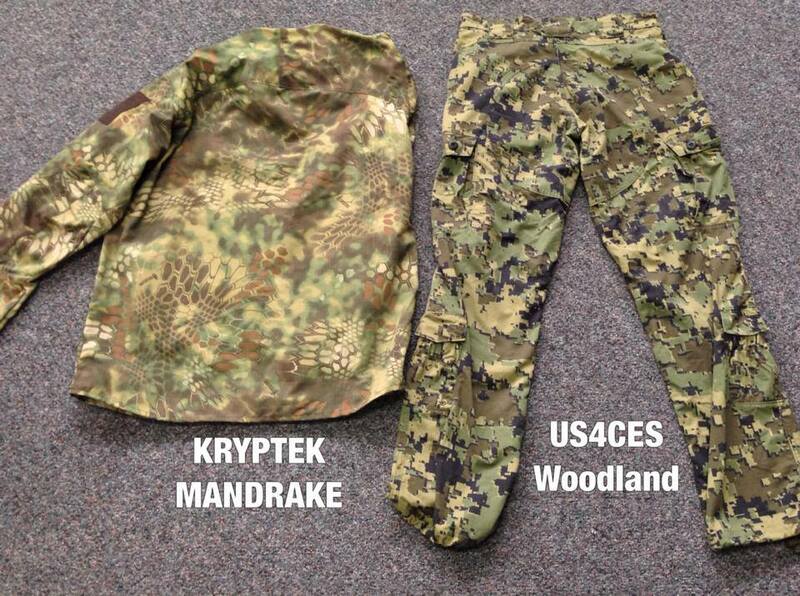 The U.S. Army Phase IV effort requires a family of camouflage patterns with a common geometry and specialized colors for each environment of Woodland/Jungle, Arid/Desert, Transitional (between Woodland and Desert) and an option for a OCIE/PPE pattern (Gear, Vests, Heavy Nylon bags) if needed. Why didn't the Army announce on June 14th? 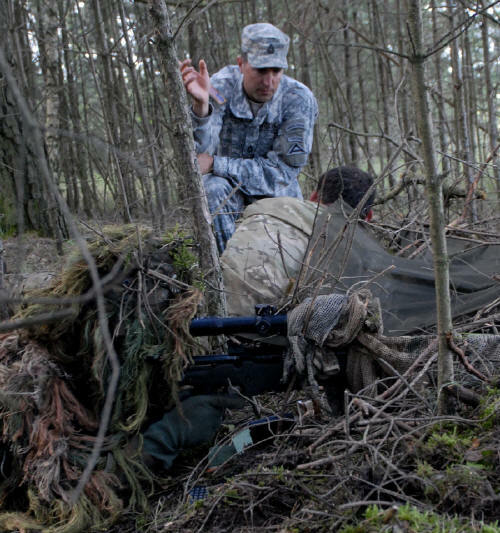 The Army has postponed announcing the winner of their Phase IV Camouflage Improvement Effort as they await a new requirement from the U.S. Government which will require all branches to share the same camouflage in combat (it has passed the Congress and is awaiting the Senate vote). 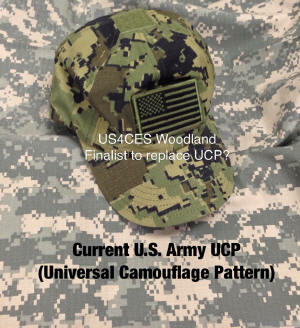 If it passes, a house subcommittee will then decide how many camouflage patterns are required: two (Woodland and Desert) or three (adding a Transitional camouflage). Since the U.S. Army has determined that three are required as a minimum, Phase IV may become the standard, or even the Phase IV Woodland/Desert family if only 2 patterns are determined. There are many other alternatives to this but each will cost more money and time or leave the Army with substandard protection. Phase IV was the largest most extensive camouflage study in the world, to provide the U.S. Army with the best camouflage uniforms in the world. Could they scrap the whole program? 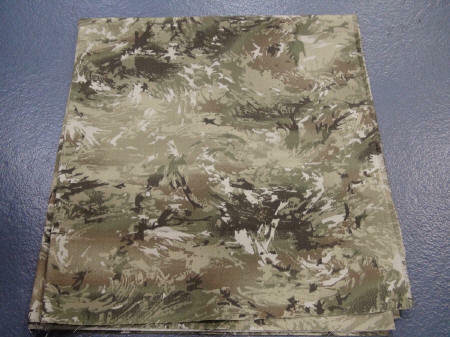 On June 4, the House Armed Services Committee narrowly agreed to require a joint combat camouflage uniform by October 2018, putting an end to branch-specific variants that have cropped up over a decade of war in Iraq and Afghanistan. 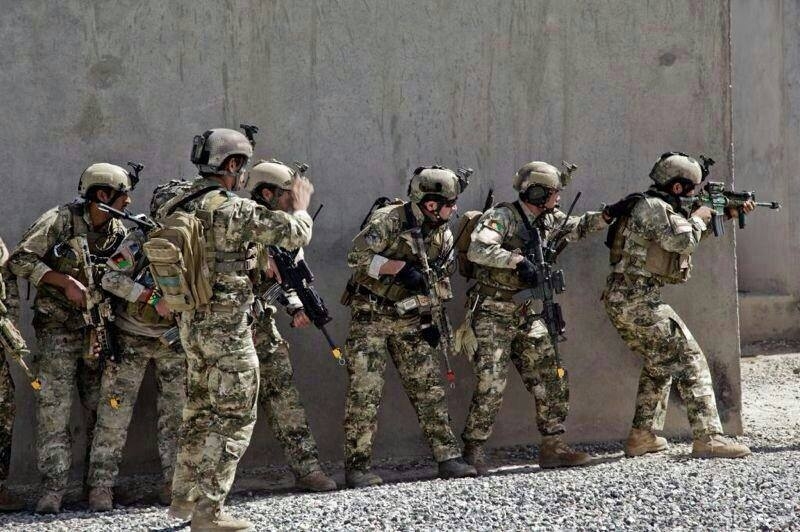 The measure provides exceptions for special operations forces, also for headgear and footgear. Yes, with the U.S. Government now looking to the U.S. Military to justify all expenditures, the need for branch specific camouflage no longer makes fiscal sense. 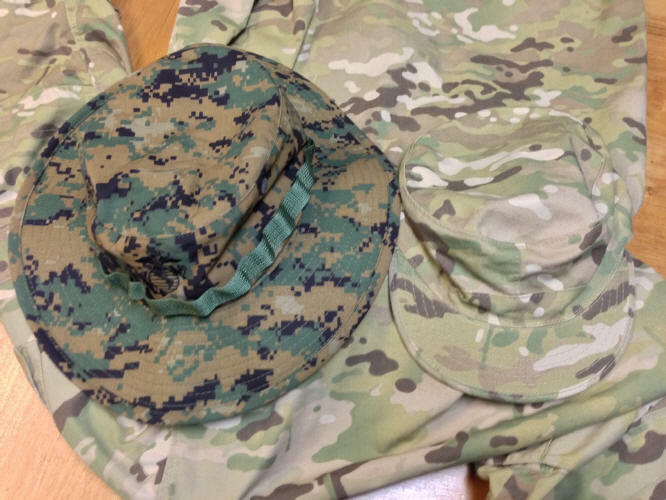 The USMC has two patterns, the Navy has three, the Air Force has one, the Army currently has two patterns with two former patterns BDU (woodland) and DCU (three color desert), which are still being replaced, so with 10 camouflage patterns and the Army ready to announce another three or four to replace their current patterns, it is no wonder that this has become a hot topic for the Congress, the Senate and the media. To have all the branches move to a common set of camouflage patterns (similar to pre-2002 era) will save many millions of dollars. 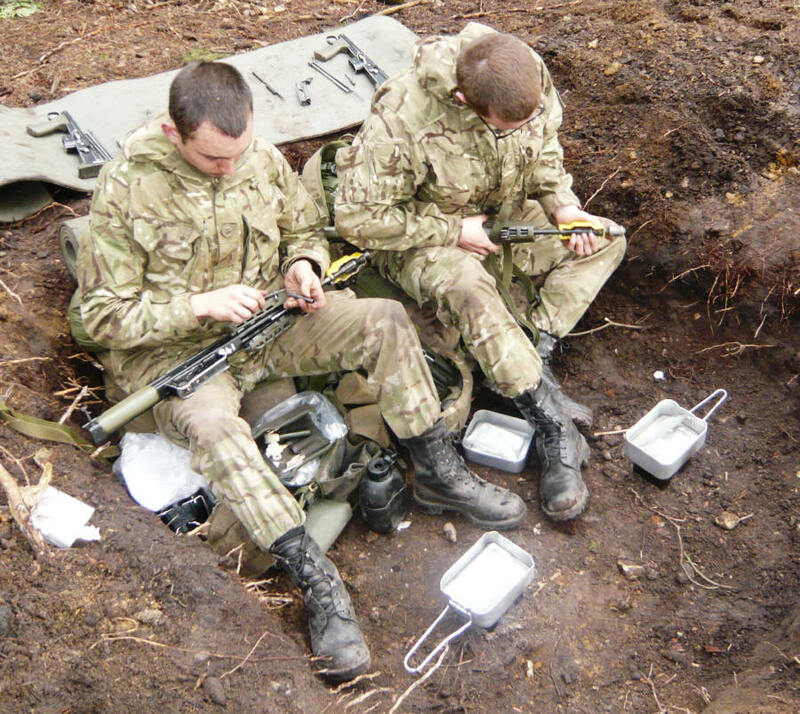 While I understand the reason for delaying due to the common camouflage decision, the Army has also indicated their Phase IV announcement could be delayed until October 2013 or later. If this is due to current budget issues with the Defense Department then something needs to be pointed out. The Army's Phase III program was to find a replacement camouflage to their failed UCP (Universal Camouflage Pattern) in Afghanistan, in 2010 they announced that Multicam won Phase III and would be called OCP (Operation Enduring Freedom Camouflage Pattern) but it would only be issued to Army soldiers deploying to Afghanistan, UCP would still be used by the Army outside of Afghanistan. The U.S Air Force also found their ABU (Airman Battle Uniform) Camouflage was not suited for combat and their ground troops in Afghanistan switched to OCP. The U.S. Government pays a royalty to the owner of OCP (Multicam) [Crye Precision - also a finalist in Phase IV] for every yard of fabric printed for required U.S. military uniforms and gear. It is not my place to say what that figure is but I can tell you the longer the Phase IV announcement is delayed, the royalty cost of OCP to the Army (and Air Force) could negate any financial benefit to the U.S. taxpayer. So why would the Phase IV program be less expensive than Phase III? The Army decided that Phase IV would be different; the Phase IV program was finalized after the costs of Phase III royalties were being realized and they understood that this model could not be justified for the entire Army requirements. 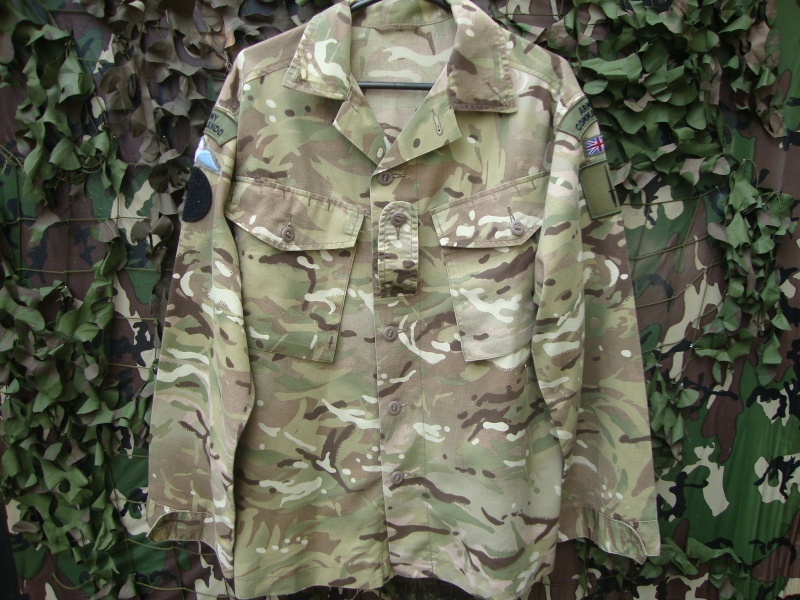 Prior to OCP the Army had developed their own camouflage patterns internally, so they never had to pay a royalty for a pattern before. The Army had come to the realization that the non-military designs had caught up to their internal designs and were now surpassing them, so rather than providing their soldiers with something less effective with no royalty attached, they opted for greater effectiveness - but this came at a cost. 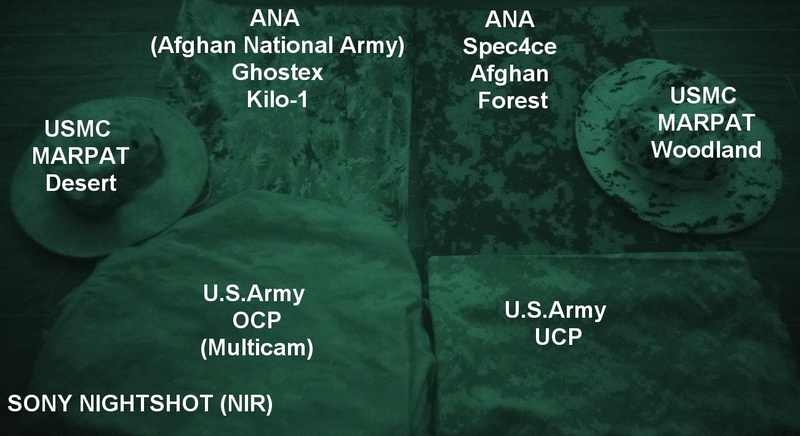 For Phase IV the Army had also determined that all in one color schemes like OCP (Multicam) while effective in Afghanistan, did not place in the top 10 in either Woodland or Desert environments, and that there were many areas of the world like Afghanistan where Woodland or Desert patterns we not as effective as a "Transitional" pattern. So the new minimum combat requirement became three camouflage patterns (four if you include snow). Remember that these companies do not get this royalty awarded unless they are the winner and that it would be a one time royalty from the U.S. Government to allow them to print whatever amount they require for however long they need to continue to have the patterns printed for Government use. 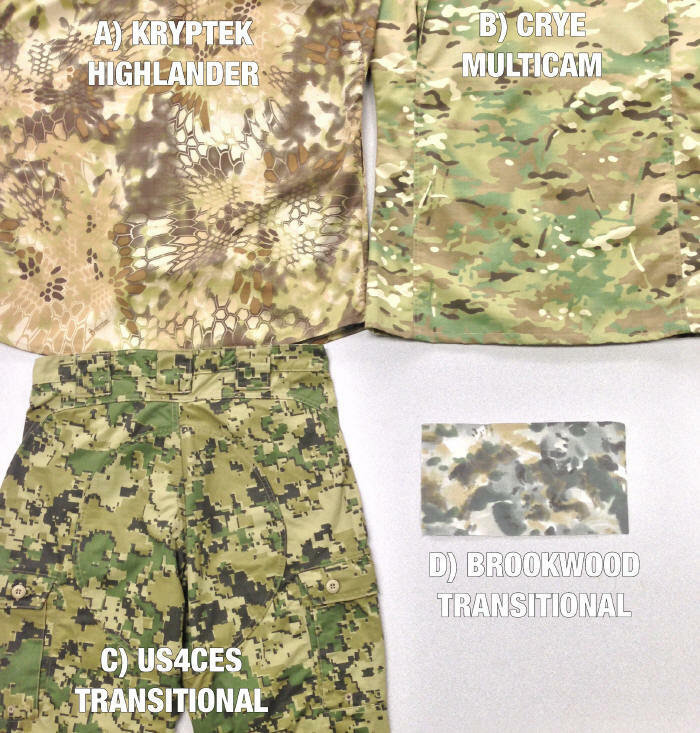 So the Army gets the best camouflage from industry and pays a minimal amount for the License (for the bottom three royalties). 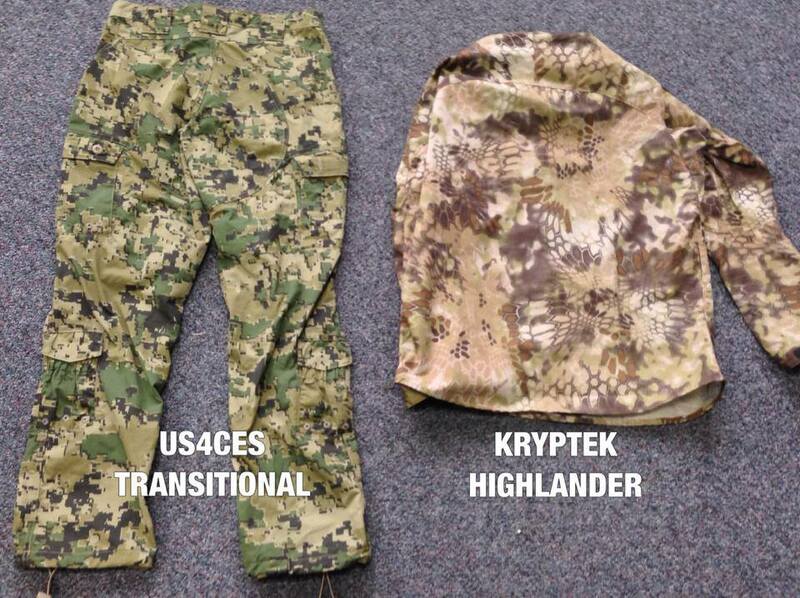 The Army did put their best tested patterns up against the four industry submissions but those patterns proved not to be as effective as the winning patterns and the Government withdrew their camouflage submissions from the competition. Where does the company that wins benefit from this model? The Army is allowing the winner to retain the commercial rights to the pattern, this should make up for the shortfall with the Government royalties. While countries like Canada have strict policy on non-military ownership of CADPAT camouflage uniforms and equipment, the U.S. really does not and they recognize this is a good way to tradeoff the expected commercial sales for the most effective patterns at very little cost to the taxpayer. 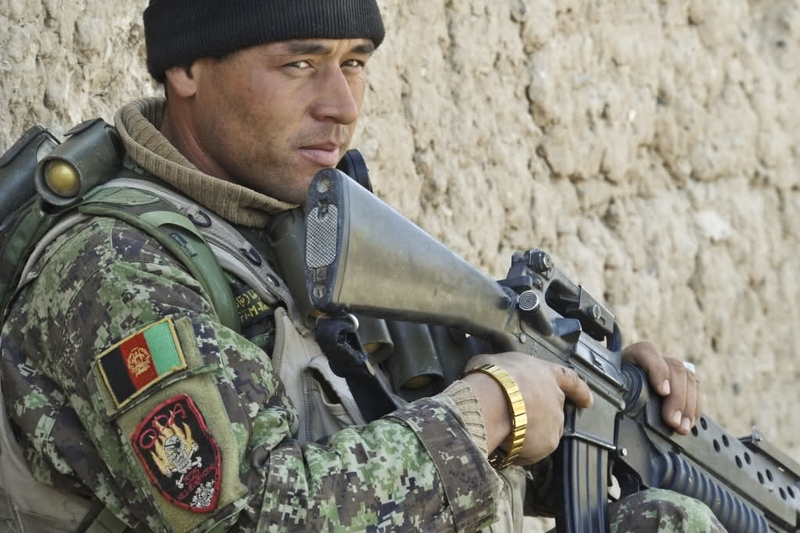 Is this a good deal for the U.S. Government? So what did the Australians get for the $US 3.1 Million? 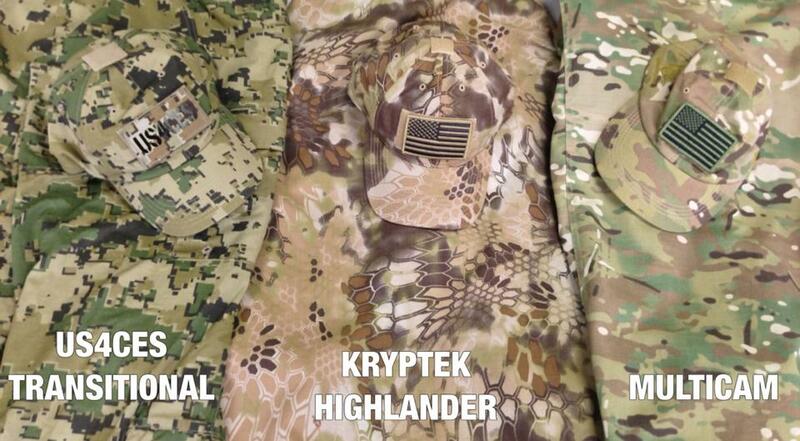 Essentially Multicam with a few subtle differences in the Cream and Dark Brown Slugs. 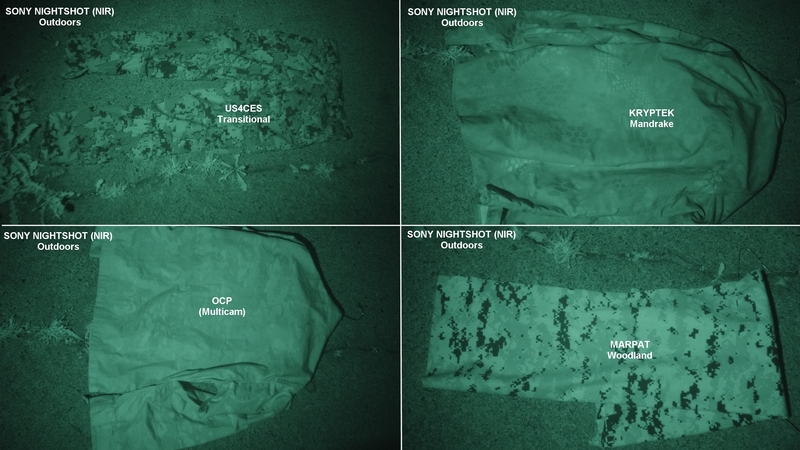 Another difference between Multicam and MTP is the scale of the pattern, Multicam repeats 24-25 inches up and down as does the Australian AMP but MTP is around a 32 inch repeat opening up the pattern by about 28% over Multicam and AMP. 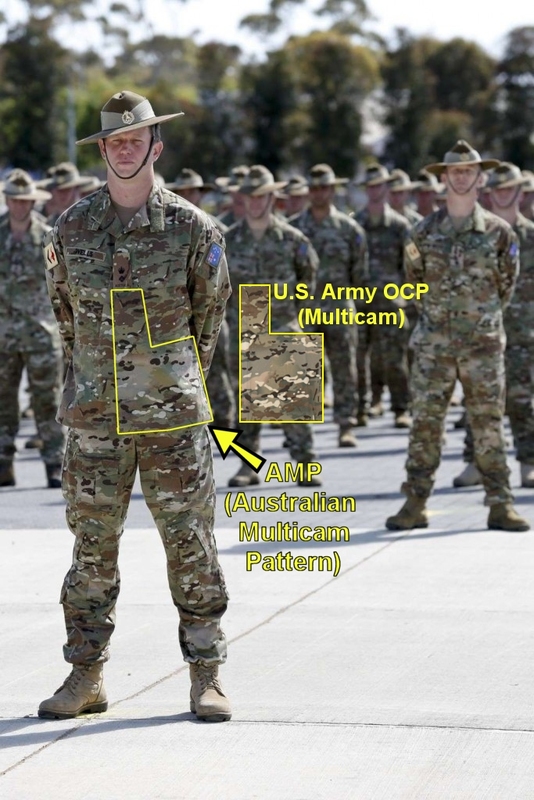 The point here is not about pattern differences but the cost to obtain a camouflage pattern for a smaller military like Australia when compared to the much larger U.S. Army and U.S. Military. The answer to the question is yes, the U.S. may be getting a very good deal compared to license per yard or an exclusive license like the Australians accepted. 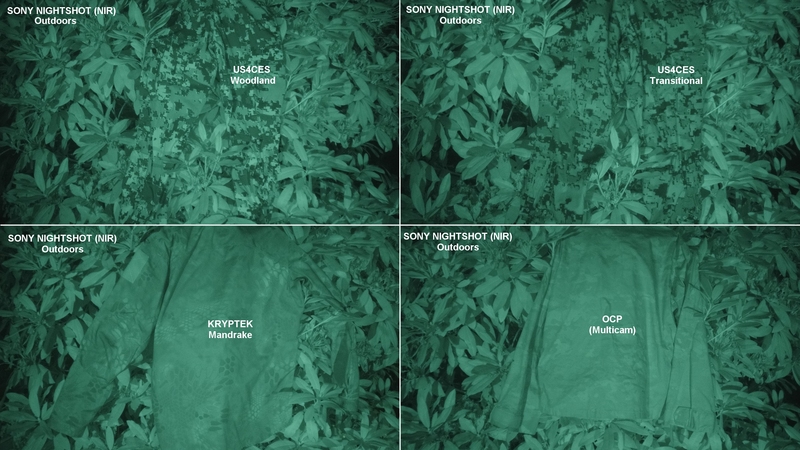 As I showed in the previous four parts, the visual part of the spectrum is the easiest part of camouflage to design for and a critical value in current camouflage concerns the reflection values of the colors in the Near Infrared (NIR) spectrum against NVG's (Night Vision Goggles) or NVD's (Night Vision Devices). As well as the SWIR (Short Wave Infrared) on the newer NVD's. 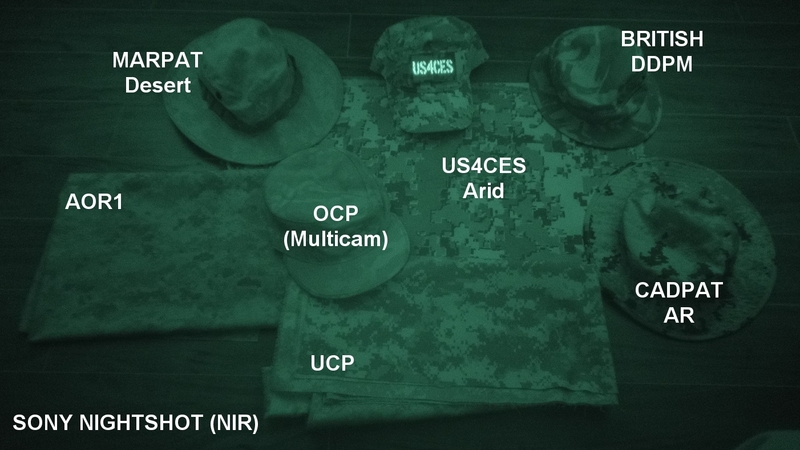 For reasons of security I will not show details on the SWIR, but two items are important in the NIR and SWIR: Material/Color Reflectance as it relates to the environmental colors reflection levels and color separation in the camouflage to remain in the NIR and SWIR to allow disruption (concealment) to continue as far down the spectrum as possible. Do you want to Blend or Disrupt - Both! 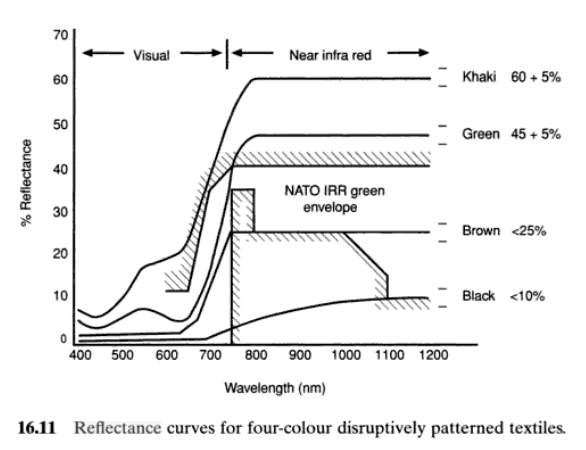 In Part 1, I showed how the three color Desert (DCU) camouflage could not be considered due to the overall brightness within the NIR. 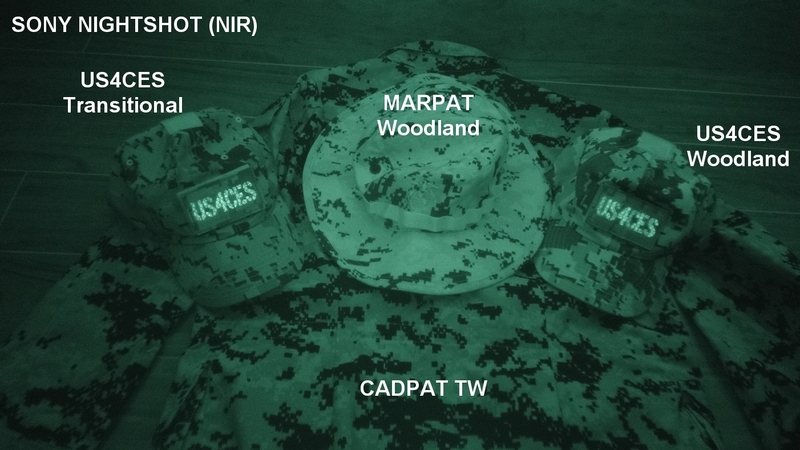 In Part 3 I showed that MARPAT was also lacking within the NIR spectrum. Now we will look at the candidate patterns and baseline patterns for the Phase IV program in the NIR. There is a reason why you can't find allot of information on the internet about current U.S. Military patterns and their function within the NIR, the simple answer is because they don't work very well. The tradeoff for a good visual pattern was to sacrifice the NIR reflection levels or make a pattern that works well in the NIR such as UCP (Universal Camouflage Pattern) and sacrifice the visual concealment in the day. There is a way to accomplish both. 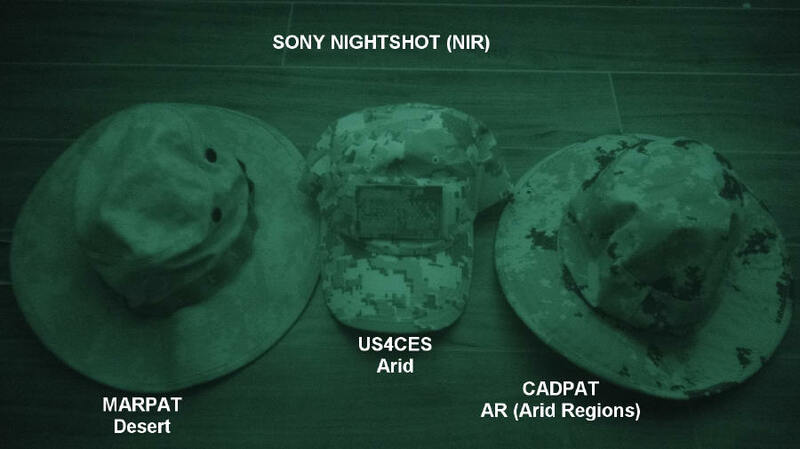 Both camouflage patterns used by the U.S. Military prior to 2001, the BDU (woodland) and DCU (desert) suffer from being overly bright in the NIR spectrum. 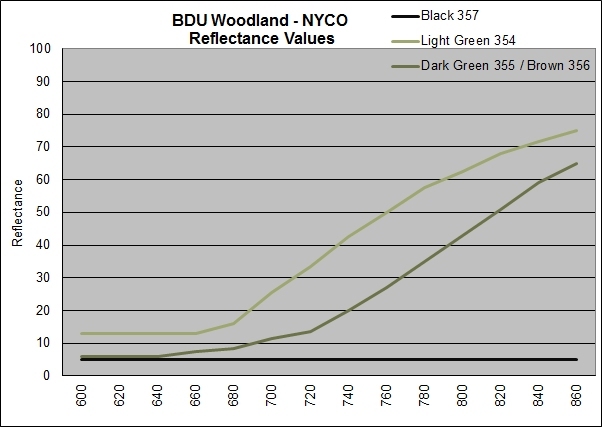 The photo below in the NIR demonstrates what the chart below the photo shows - the Brown and Green colors have merged into the same reflectance, the Light Green is only slightly brighter (providing no real disruptive property) and the Black is very Black. 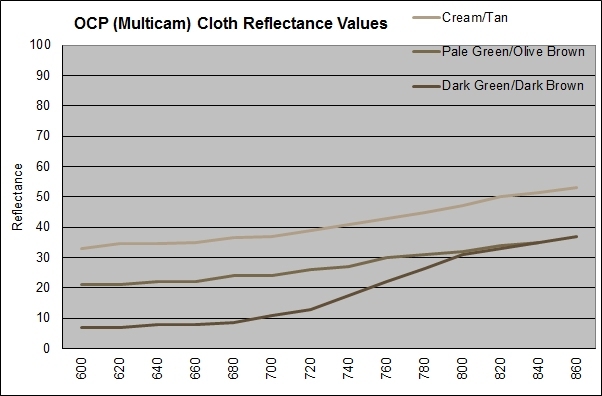 The chart below are the Reflectance values for each color - notice how Dark Green and Brown have the same value and in the photo above you cannot see any difference between those two colors. 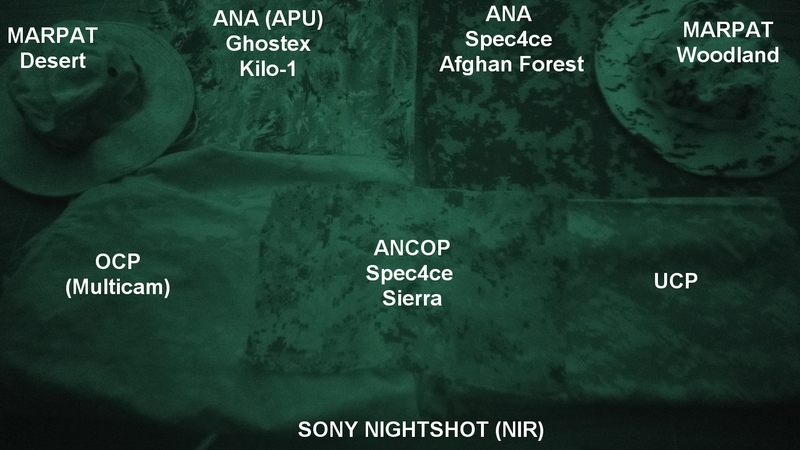 Below is where NATO expects green reflectance to fall within the infrared camouflage reflectance to be but you also want color separation as far down the spectrum as shown with their old DPM Woodland camouflage, so the BDU Dark Green/Brown colors are 15%-20% brighter than they should be. 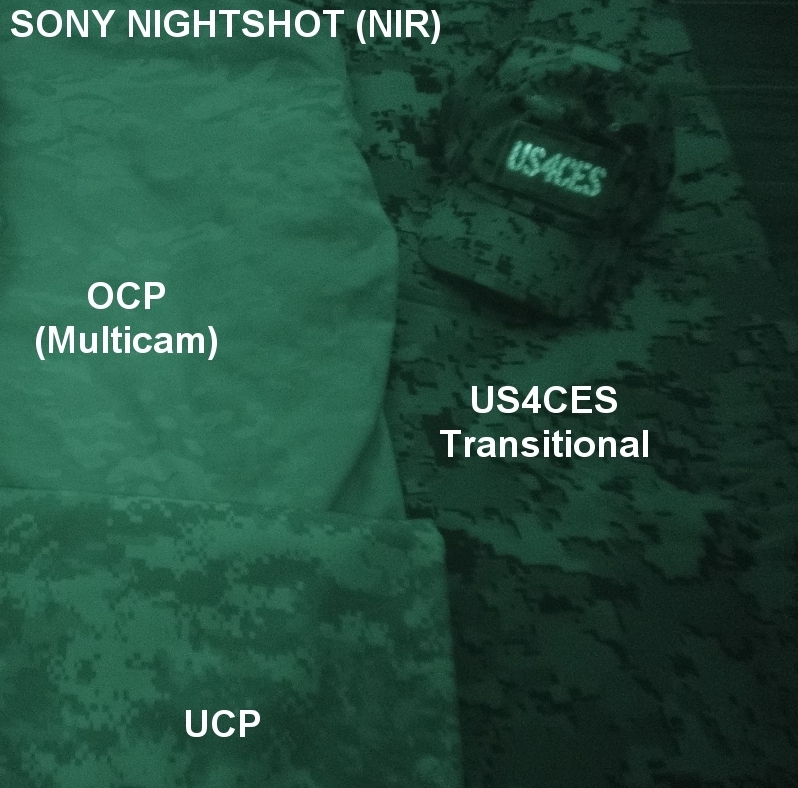 Let's look at OCP (Multicam); After taking this comparison photo in the NIR, I went to recheck the Multicam hat to make sure it was an unwashed milspec (military specified) cap, it was. The photo below shows the same OCP (Multicam) Patrol cap from the NIR photo above, on top of an unwashed NYCO (Nylon/Cotton) Multicam jacket, next to the official MARPAT Woodland Boonie hat which is also used in the NIR photo above (without the jacket). About a 16% separation between the seven colors at 860 nm and the dark colors begin to merge into the Pale Green and Olive Brown so we only perceive 2 different colors at this level, which is exactly what we see in the NIR photo. 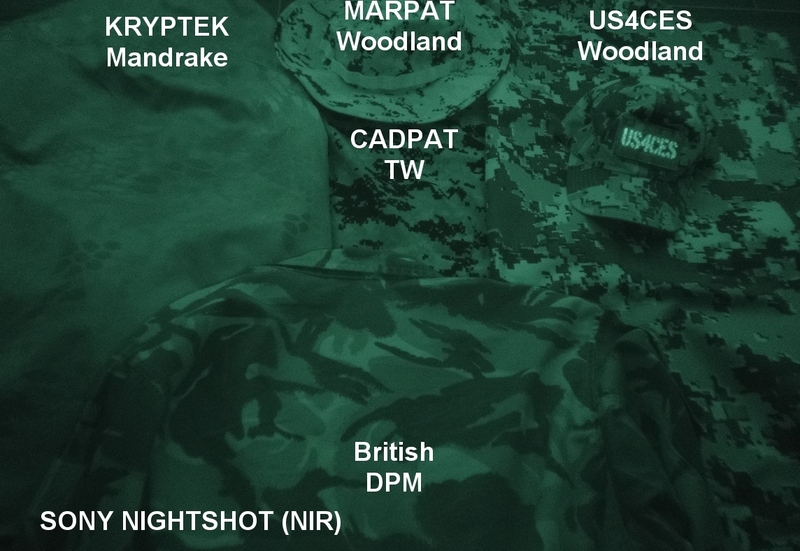 In the photo below I've put in an OCP Jacket (it is not just the hat that reflects this way) and UCP (Universal Camouflage Pattern) a pattern that is ineffective in the day time actually does better in the NIR than MARPAT Woodland, and OCP. The UCP still has all three color shades still visible at this level. 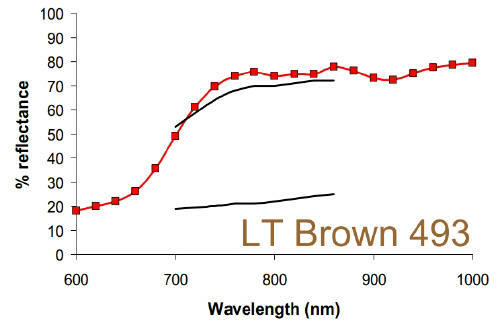 The reflectance values and color separation below for UCP match what the photo shows above, it does lack the darker elements that US4CES Transitional has. As you can see from this Near Infrared (NIR) photo - the ANA owns the night as NIR reflection levels were a primary concern. The four main U.S. Military patterns are less effective at night than either of the two ANA patterns. 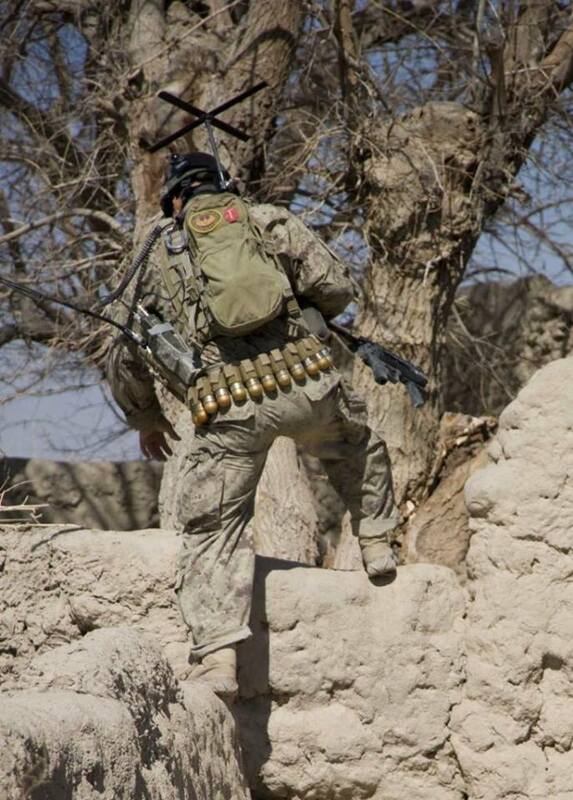 Even the Elite ANCOP (Afghanistan National Civil Order Police) required an effective day camouflage but also with adequate NIR protection. U.S. Special Forces photographed using our Spec4ce Sierra Pattern This Hyperstealth pattern is licensed to the Afghan Civil Order Police (ANCOP). The photo is now a couple of years old. Members of the Nevada National Guard, 137th Military Police Detachment, part of the NATO Training Mission-Afghanistan stationed at Camp Mike Spann and Camp Marmal in northern Afghanistan, participated in a Afghan National Civil Order Police lead patrol through the village of Ieshraf Qala Dec. 2. 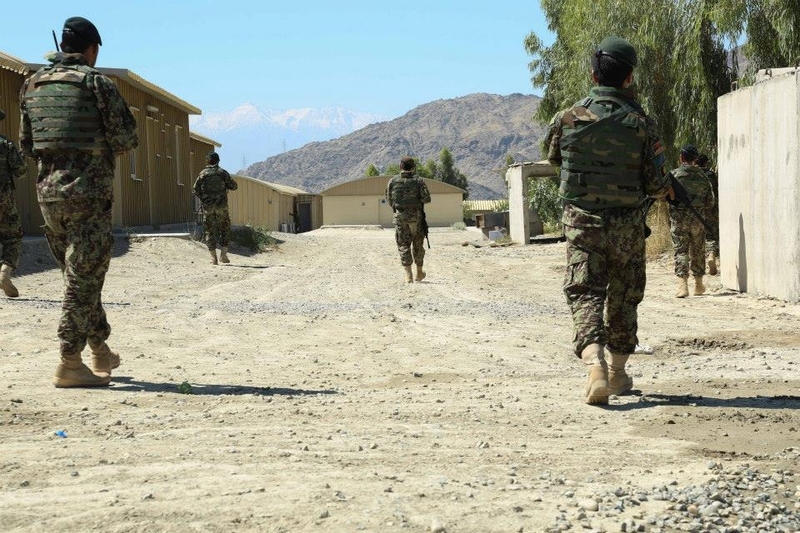 This patrol is the end result of the 137th training with the ANCOP which has been ongoing for several weeks. 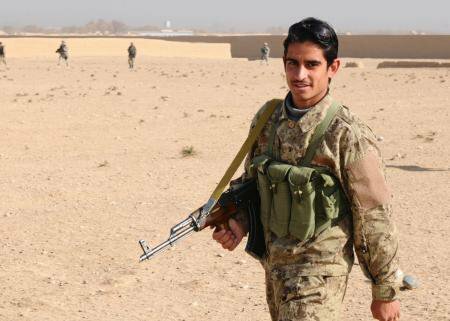 The patrol came across even a unexploded ordinance in the form of a mortar round. 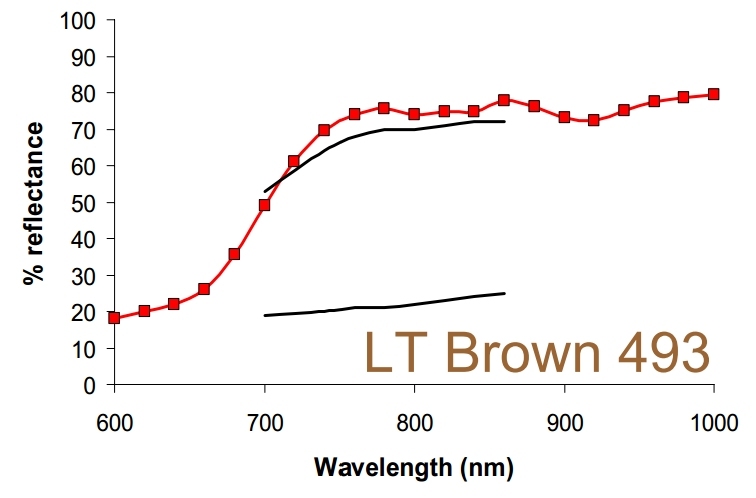 There is also another way to determine what is happening in the NIR with a pattern, spectrometer testing. Notice below with the OCP (Multicam) how the Pale Green (Pgrn 526) the third brightest color out of the seven in the Visual Spectrum, yet this color becomes the darkest after 800 nm. 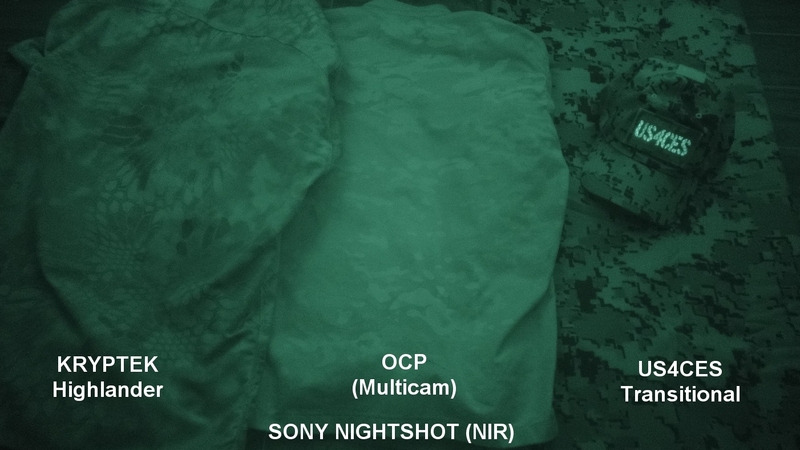 If I was able to show you farther down the spectrum, you would see that the seven colors of Multicam converge into one color at about 960 nm and continue as one color reflectance after that. 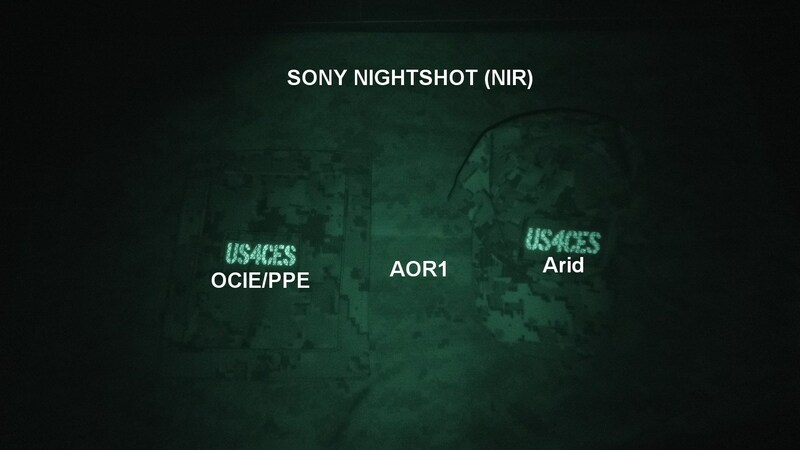 If that deviates from the background reflection level, the soldier can easily be identified by the enemy with NVD's. 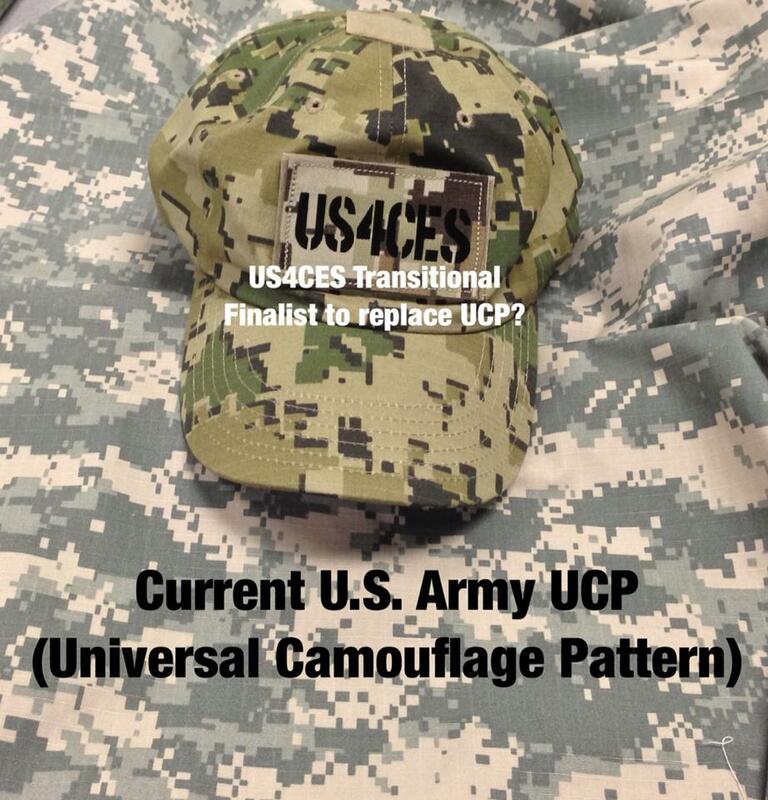 Below is a photo of US4CES Arid uniform with US4CES OCIE coloration on the vest, (The US4CES OCIE is colored to work with all three environments as this type of gear is to expensive to print in three different color versions). This color separation with US4CES OCIE allows for disruption and concealment all the way into and through the SWIR spectrum (currently used by only some Special Forces, but expected to become more affordable within the next few years and expected to be available to adversarial countries down the road). 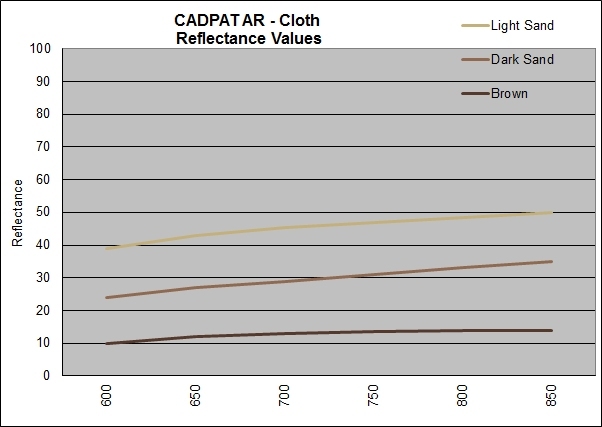 Where do you want to be with reflectance in the NIR. 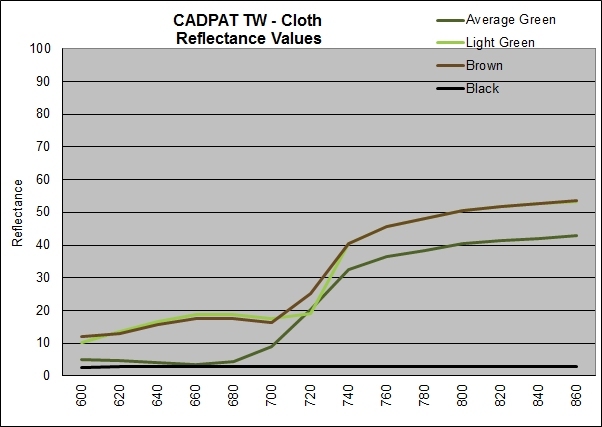 For Woodland CADPAT TW (Temperate Woodland) is a good marker as the main color "Average Green" was used to match the reflection of chlorophyll. 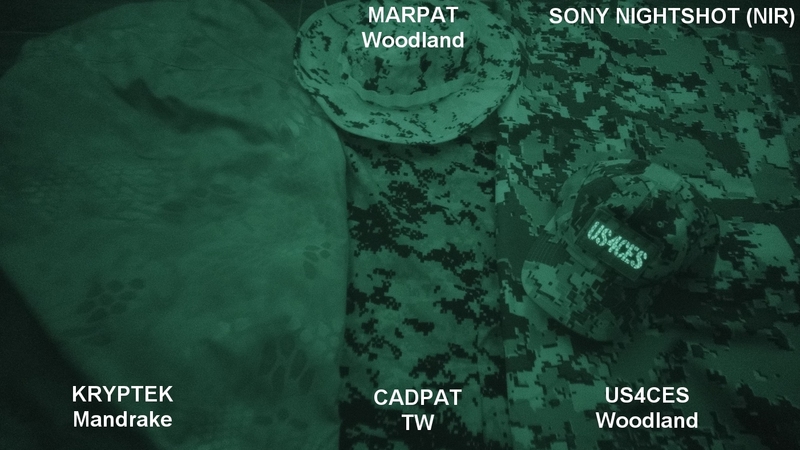 As you can see MARPAT Woodland is much brighter than CADPAT TW and both US4CES Woodland and Transitional have a similar reflection with colors that are both brighter and darker to better simulate each one of those two environments. With Arid/Desert we knew there was more variation in the NIR and more room to improve which is why we went with a brighter layer with our fourth color. 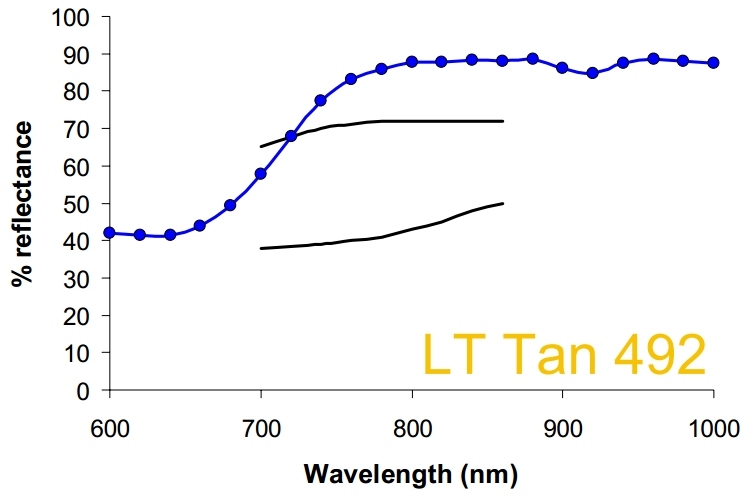 In Part 1 we discussed that DCU was overall to bright in the NIR but it won the testing in the Visual spectrum, so how do we retain the effectiveness of DCU with an acceptable NIR. 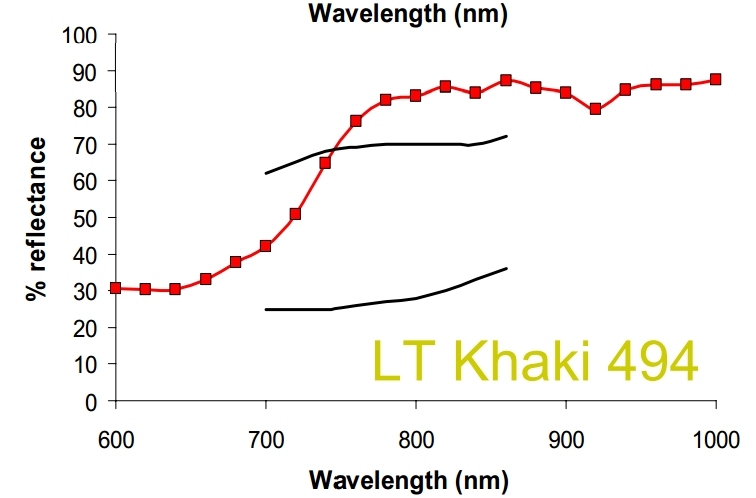 We looked to the research with the DCU colors in the NIR and found the tolerance in the brightest color was much higher than CADPAT AR allowed for. 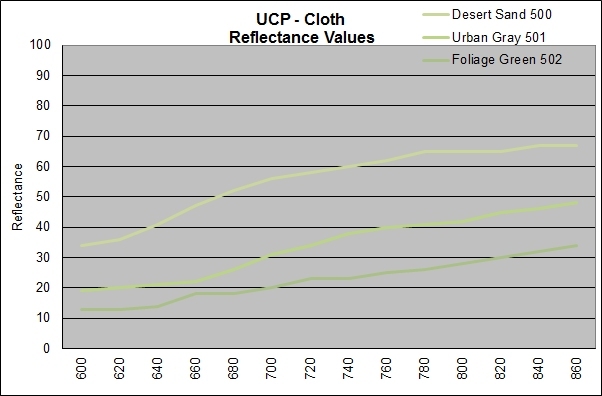 Below are the readings for DCU printed on heavy nylon (vests, pouches and bags). 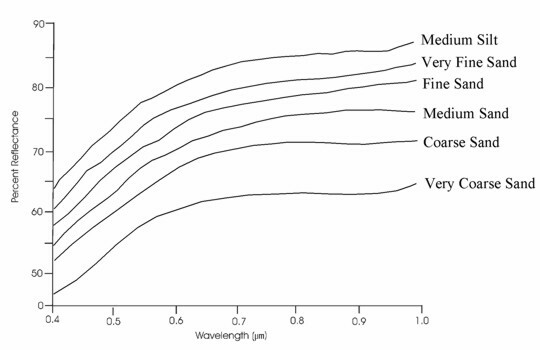 The Black lines indicate Minimum and Maximum Requirements. Each of the three colors is brighter than acceptable but we used the Maximum Requirement (Top black line of Lt Tan 492) as a threshold for our Lightest color in US4CES Arid. There are four industry submissions: Brookwood has not released their patterns other than a few images. 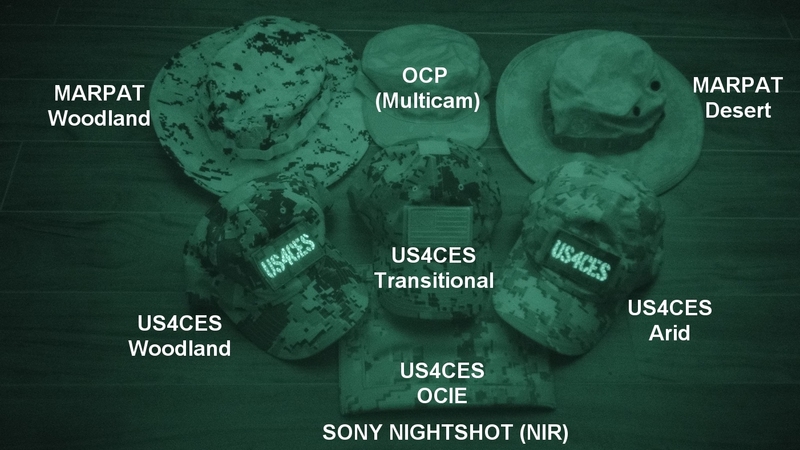 Crye has not released any information on their submission but a couple of people from ADS Inc. have seen all three of Crye's submissions (at a Phase IV finalist meeting) and believe that it is Multicam with a darker version for Woodland and a Desert colored Version for arid/desert, while their transitional coloration uses something identical or similar to their current Multicam. As Multicam is the U.S. Army baseline pattern for Transitional, I've included it in these comparisons. Kryptek has released their patterns commercially thus providing us the ability to purchase their three submissions printed on 50/50 NYCO to compare with our 50/50 NYCO submissions. 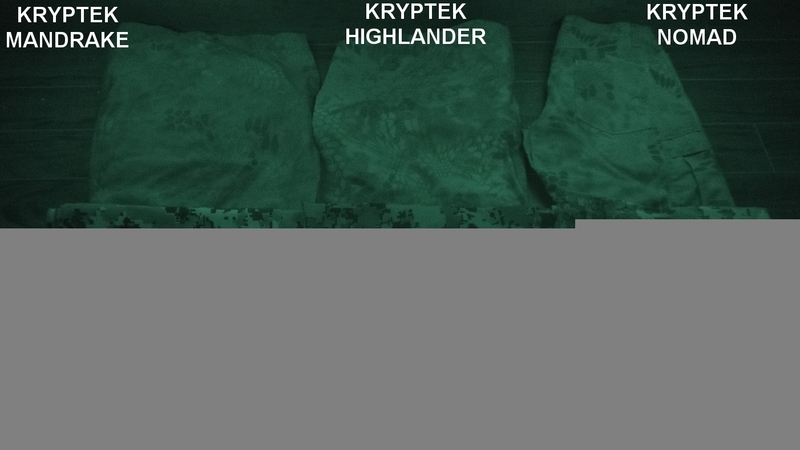 We can also test and compare the Kryptek NIR reflection levels. Notice below in the side by side comparison of the same area of the Mandrake pattern that the Darkest color which creates much of the disruption in the visual spectrum has merged with the middle colors and their rich Brown/Red color is now the darkest color within the NIR. 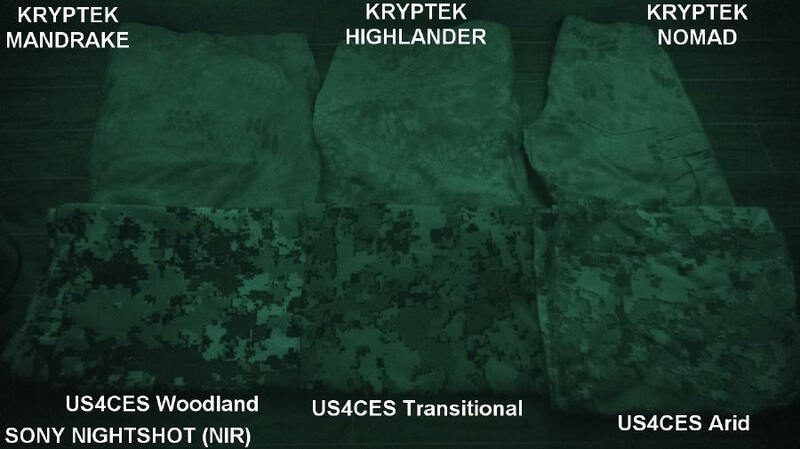 In the NIR, Kryptek Highlander is slightly darker than Multicam but is still lacking contrast to separate the colors the way US4CES Transitional does within this frequency of the NIR. 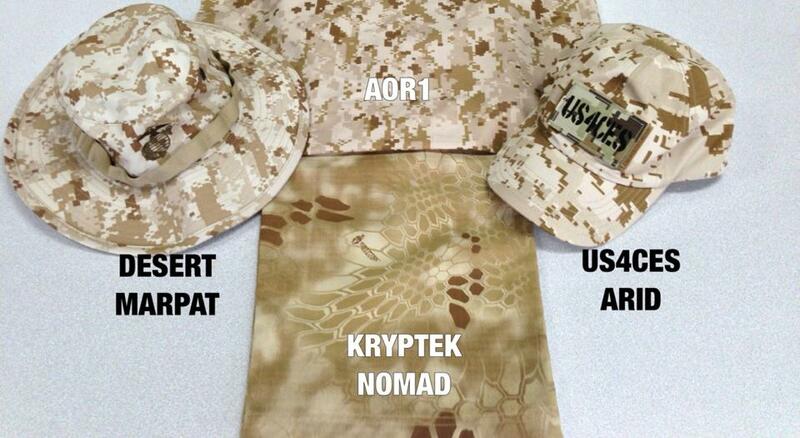 Kryptek Nomad is their Arid/Desert Submission. 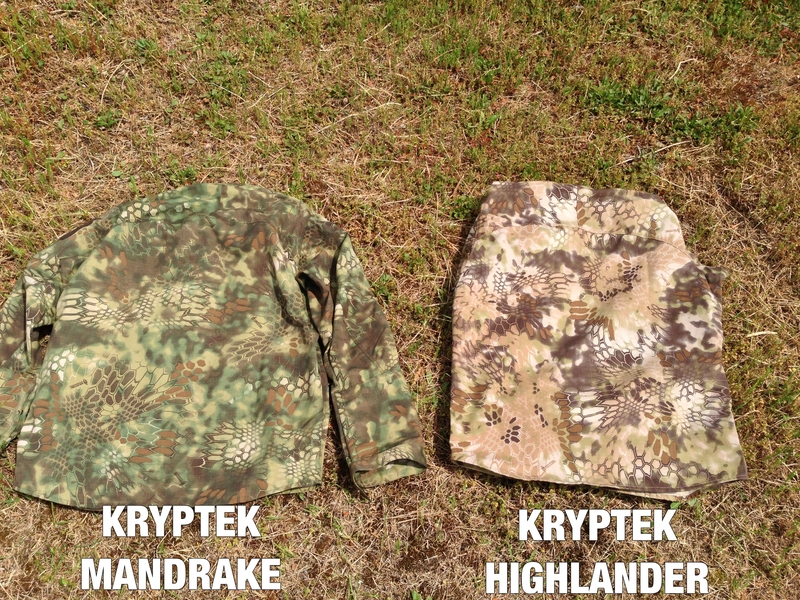 With MARPAT Desert, being beaten by AOR1 for effectiveness in Desert environments to become the baseline, and DCU being even better in the visual spectrum, the color of Kryptek Nomad is much darker than the three other desert patterns here. 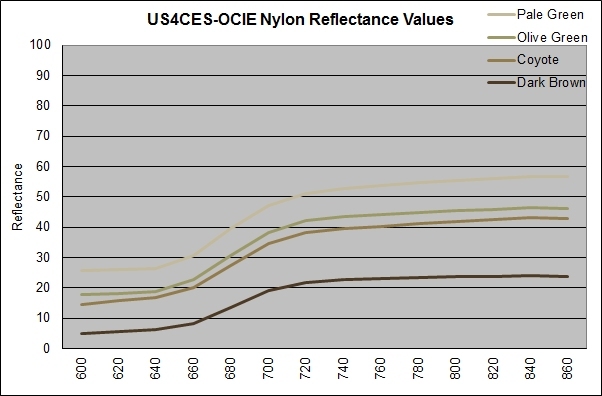 The overall NIR reflection level of Kryptek Nomad lacks the contrast of CADPAT AR and US4CES Arid. One large area of concern with camouflage is Urban environments, asphalt and concrete reflect differently than grass, plants and leaves. 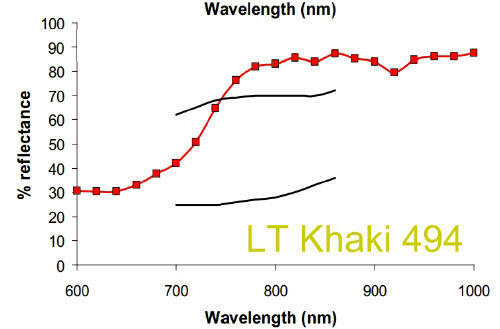 The asphalt and concrete may be brighter in the visual spectrum, but they are actually darker in the NIR spectrum. 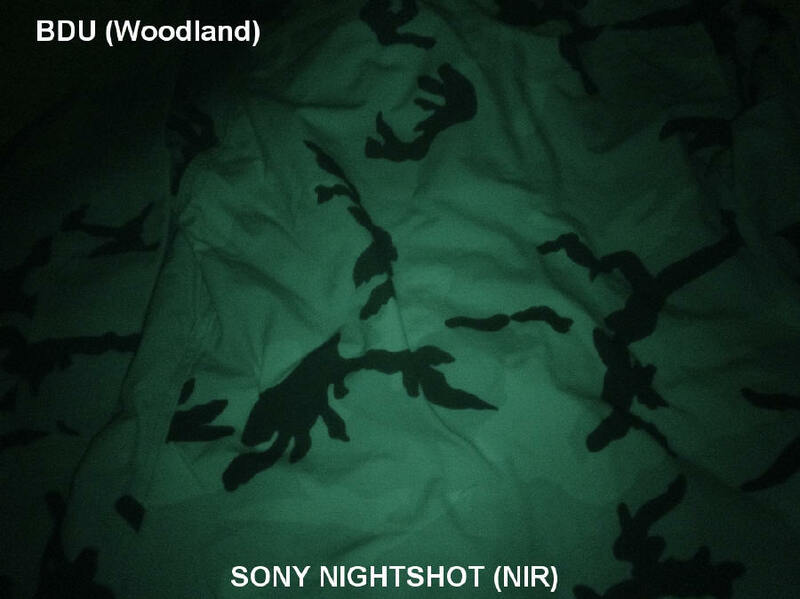 If your camouflage is locked into only matching green plants in the NIR then it is going to shine in these Urban environments. The U.S. Senate has now stepped in and changed a few items the House had asked for (22). 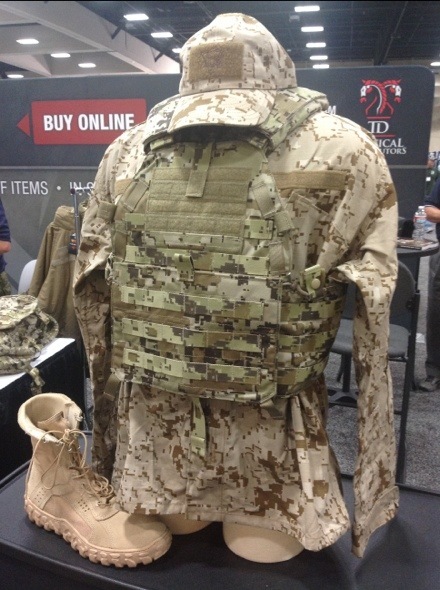 ...The committee notes that the recommended provision would also restrict any military service from preventing another military service from authorizing the use of any combat or camouflage utility uniform. 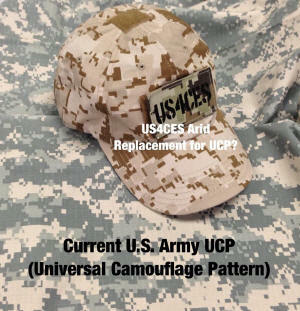 Additionally, after the date of enactment of this Act, each military service would be prohibited from adopting new designs for combat and camouflage utility uniforms, including uniforms reflecting changes to the fabric and camouflage patterns used in current combat and camouflage utility uniforms, unless the services adopt a uniform currently in use, all services adopt the same combat or camouflage utility uniform, or the Secretary of Defense determines that unique circumstances or requirements justify an exception to the policy. 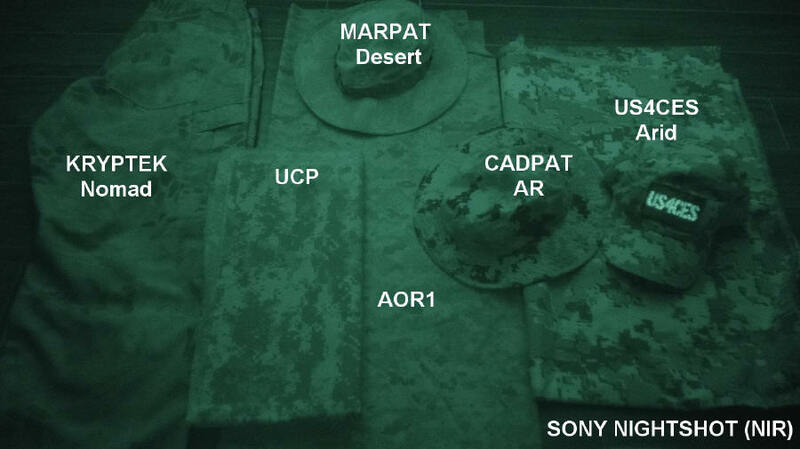 The Army needs to announce the winner before the date of enactment, if they do not, they may end up having to use MARPAT or AOR1 and AOR2 if it is determined only two environments (Woodland/Desert) are required or if transitional is also and included environment, then OCP (Multicam) with the Phase III royalty structure still in place and any money the Army was try to save the taxpayer with the Phase IV royalty structure will also be lost and any benefits to the soldier for better concealment than what is currently available in the Visual/NIR/SWIR spectrums will not be realized.